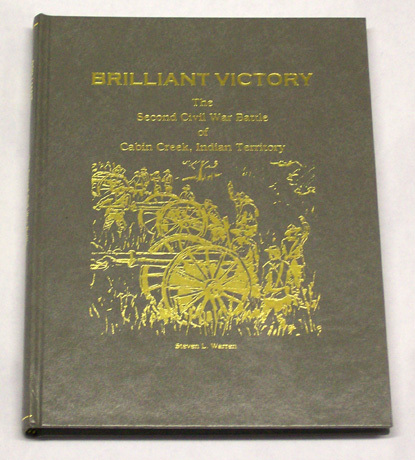 Get ready to ride on a raid with Stand Watie with the release Steven L. Warren’s new book "Brilliant Victory: The Second Civil War Battle of Cabin Creek, Indian Territory." Warren’s book tells the entire story of the last Confederate offensive into northern Indian Territory in September of 1864. The book chronicles the successful raid led by Confederate brigadier generals Richard M. Gano and Stand Watie. On September 19, 1864, their rag tag force consisting of 2,000 Texas and Indian troops, surprised and captured a Union supply train of 300 wagons, including 1,800 mules and horses at the Cabin Creek station, Cherokee Nation. Watie and Gano’s men made it safely back to the Confederate lines with 130 wagons filled with much need supplies and 740 mules. The captured supplies were later estimated to have been worth more than $1.5 million in 1864 dollars. In a congratulatory order published in October of 1864, Lieutenant General Edmund Kirby-Smith, the commander of all Confederate forces west of the Mississippi River, noted the success of "one of the most brilliant raids of the entire war." Watie, Gano and their respective commands received a special commendation from the Confederate Congress in January of 1865 for the capture of the wagon train. Warren documents the events leading up to the capture of the wagon train at Cabin Creek, including the battle at Flat Rock, which occurred north of present-day Wagoner, Oklahoma. At Flat Rock, black soldiers of Company K, First Kansas Colored Infantry were massacred by the bloodthirsty Confederate troops. The author also writes about the Union forces attempt to recapture the wagon train at Pryor Creek. "It’s a great story," Warren said. "It’s amazing what Watie and Gano’s men accomplished. The Texans and Indians didn’t really trust one another, and yet they worked together to go far behind enemy lines and capture a very valuable wagon train." A recognized authority on the Civil War battles at Cabin Creek, Warren has made presentations to historical and genealogical groups throughout Oklahoma, Kansas, Arkansas and Washington state. Warren is working on a screenplay about the Cabin Creek battle and recently was awarded the Jefferson Davis Historical Gold Medal for his work in this area through the Cowskin Prairie Chapter of the United Daughters of the Confederacy. This is his first book, but it’s not his first project on the Civil War in Indian Territory. In 1992, Warren and Rick Harding of Bartlesville, Oklahoma released the 90-minute documentary "Last Raid at Cabin Creek," which Warren wrote and co-produced. Videotapes and DVDs of the program have been sold to libraries across the country. The documentary has also been successful in the home video market. It has won numerous awards, including recognition from the state of Oklahoma. The program was added to the collection of the Smithsonian Institution’s Museum of American History in 1998. The book is hardback, 8½" by 11", 230 pages with photographs, maps, appendices and index, ISBN 978-0-944619-66-7. Only 500 of this first edition were published and when they are gone, the author has no plans for further hardbound editions. The book also features the partial war diary of Richard M. Gano, highlighting his early service in the early Indian Wars on the Texas plains and as the Lieutenant Colonel of the 7th Kentucky Cavalry, which was attached under General John Hunt Morgan’s command. Click here to read a book review of this publication. Click here to read another book review of this publication. A 20-year veteran of the television industry, Warren is a descendant of both Union and Confederate veterans. He received his M.A. in Journalism from the University of Oklahoma in 1983 and his B.A. in Communications from the University of Tulsa in 1982. He is a 1978 graduate of Claremore High School, Claremore, Oklahoma. He is a member of the Oklahoma Historical Society, Civil War Preservation Trust, Friends of Cabin Creek Battlefield, Sons of Union Veterans of the Civil War, and the Friends of the Hunley. He and his wife Amy and their two daughters currently live in Overland Park, Kansas. The Cabin Creek Battlefield Park is located three and one-half miles north of Pensacola, Oklahoma from Oklahoma State Highway 28. The park is owned by the Oklahoma Historical Society and is maintained by the Friends of Cabin Creek Battlefield, Inc., a local volunteer group. The park is open from daylight to dusk, 365 days a year. The park is usually host to reenactment enthusiasts every three years as a rotating program sponsored by the Oklahoma Historical Society (last scheduled reenactment of 2010 was canceled due to Oklahoma governmental budget cuts). 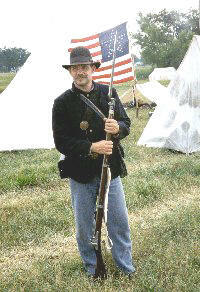 September 29, 2012 the battlefield is to host an encampment.